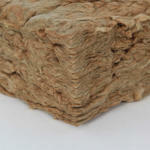 The Rockwool Slab range can be used for a variety of different thermal, acoustic and fire insulation projects. Its versatility means that it can work as well in walls and floors as it can roofs and industrial locations. Rockwool boasts a range of excellent characteristics, including the ability to repel water and a heavy resistance to high temperatures. It’s also extremely cost- effective and very, very durable, requiring no maintenance. The slabs are constructed using high quality resin bond, with specialist sizes, thicknesses and densities also available to order for special situations. Rockwool Slabs are semi-rigid and flexible, suitable for thermal, acoustic and fire insulation. They come in packs; the coverage per pack depends on the thickness required. Standard sizes are 30mm, 50mm, 75mm and 100mm.